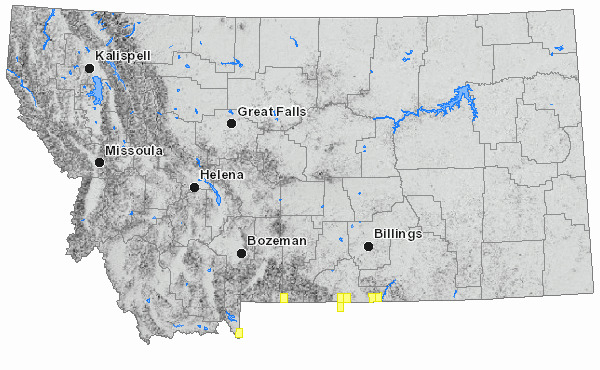 This is a very limited system within Montana, with small patches occuring in the Wyoming Basin ecoregion. Its state rank is based on its limited distribution; nationally it is more secure. This is a very minor ecological system found in southeastern Montana at elevations of 1,065- 1,220 meters (3,500-4,000 feet) on steep-facing erodible badlands. The environment in this region of Montana is characterized by annual precipitation of 12 inches or less, warm to hot summers and cold winters with variable amounts of snow cover. Soils on sites supporting this system are alkaline or saline Entisols. This shrub- dominated community typically contains one or more saltbush (Atriplex) species, such as shadscale saltbush (Atriplex confertifolia) or fourwing saltbush (Atriplex canescens). Some occurrences contain a mixture of saltbush species and Wyoming sagebrush (Artemisia tridentata ssp. wyomingensis) and other shrub species. The understory is dominated by grasses, e.g, Indian ricegrass (Achnatherum hymenoides), blue grama (Bouteloua gracilis), western wheatgrass (Pascopyrum smithii), Sandberg’s bluegrass (Poa secunda), alkali sacaton (Sporobolus airoides), needle and thread (Hesperostipa comata), saline wild rye (Leymus salinus), bluebunch wheatgrass (Pseudoroegneria spicata) and inland saltgrass (Distichlis spicata). Forb cover is generally very low. Disturbances within this system may lead to an increase in invasive annual grasses and forbs. This system occurs in Montana on steep facing, erodible badlands in Carbon County at 1,065-1,220 meters (3,500-4,000 feet), but it is not well developed or represented. In Wyoming, it occurs in the Great Divide and Bighorn Basins. Elsewhere, it occurs throughout the western interior and intermountain United States, and in areas of the southern Great Plains in eastern New Mexico. Approximately 1 square kilometers are classified as Mixed Salt Desert Scrub in the 2017 Montana Land Cover layers. Grid on map is based on USGS 7.5 minute quadrangle map boundaries. This is typically a system of extreme climatic conditions, with warm to hot summers and freezing winters. In Montana, annual precipitation is generally 30 centimeters (12 inches) or less. Precipitation usually occurs in spring after snowmelt as intermittent spring rains and sometimes during late summer or fall. Soils are shallow to moderately deep, poorly developed, and a product of an arid climate with little precipitation. Soils are often alkaline or saline, poorly developed Entisols. Vegetation is composed of one or more saltbush (Atriplex) species, such as shadscale saltbush (Atriplex confertifolia) or fourwing saltbush (Atriplex canescens). Some occurrences contain a mixture of saltbush species and Wyoming sagebrush (Artemisia tridentata ssp. wyomingensis). Spiny hopsage (Grayia spinosa) tends to occur on silty coppice dunes. Other shrubs may include winterfat (Krascheninnikovia lanata), green rabbitbrush (Chrysothamnus viscidiflorus), rubber rabbit brush (Ericameria nauseosa), broom snakeweed (Gutierrezia sarothrae),budsage brush (Picrothamnus desertorum), shortspine horse brush (Tetradymia spinosa) andsoapweed yucca (Yucca glauca).Prickly pear (Opuntia species) may be present in some occurrences. Trees are not usually present, but some scattered RockyMountain juniper (Juniperus scopulorum) may be found. Inland saltgrass (Distichlis spicata). Forb cover is generally very low. Annual native species are common on recently disturbed sites within this system and include species such as plantain (Plantago species), sixweeks fescue (Vulpia octoflora), or Nuttall’s povertyweed (Monolepis nuttalliana). Halophytic annuals include western glasswort (Salicornia rubra)and seepweed (Suaeda species). Perennial forbs may include boreal sagewort (Artemisia frigida), scarlet globe mallow (Sphaeralcea coccinea),and blazing star (Mentzelia species). Exotic annuals such as Russian thistle (Salsola kali) and cheatgrass (Bromus tectorum) are frequently found in this system. Species of the salt-desert shrub complex have different degrees of tolerance to salinity and aridity, and so tend to sort themselves out along a moisture/salinity gradient (West 1982). The harsh environmental conditions of these systems slow down community dynamics. The same species or species similar in stature or appearance often succeed each other after disturbances. Fire frequency was historically very low in this system. Heavy sheep grazing practices can significantly impact vigor and cover of the principal shrub species, leading to an increase of annual bromes (Bromus species) and other exotic annual forbs. Sites invaded with exotic annuals are changing the dynamics of this system by increasing fire potential, severity and spread. Historically, fire was rare in this system due to the characteristic low plant cover. Excessive grazing can result in the demise of the most common perennial grasses in this system and lead to an abundance cheatgrass and other invasive annuals. Off-road vehicle travel can be a significant disturbance. Natural regeneration of saltbush species and their associates occurs where old plants existed in the interspaces, due to accumulated organic matter and nutrients and more favorable moisture (West, 1982). Shrub seedlings should be planted in these microsites, where and when they exist on a restoration site, to improve survival rates. Dominant species have been used to stabilize soils and to reclaim disturbed sites (Carlson et al, 1984). Carlson, J. R., J. G. Schutz, and W. R. Oaks. 1983. Seed production technique of two chenopods: Gardner saltbush and winterfat. Pp. 191-195 in A. R. Tiedemann, E. D. McArthur, H. C. Stutz, R. Stevens, and K. C. Johnson, comps., Proc. Symposium on the Biology of Atriplex and related chenopods. USDA For. Serve Gen. Tech. Rep. INT-172. 309 pp. West NE. 1982. Dynamics of plant communities dominated by chenopod shrubs. Internationl Journal and Ecology and Environmental Science(8):73-84.